Plumbago shrubs are evergreen perennials originally native to southern Africa, prized for their attractive flowers. They can have a trailing or upright growth habit, depending on cultivar. Plumbago shrubs produce brightly colored white or sky-blue flowers and are tolerant of a wide range of environmental conditions. Like most flowering shrubs, Plumbago grows most vigorously and blooms most profusely with regular pruning. 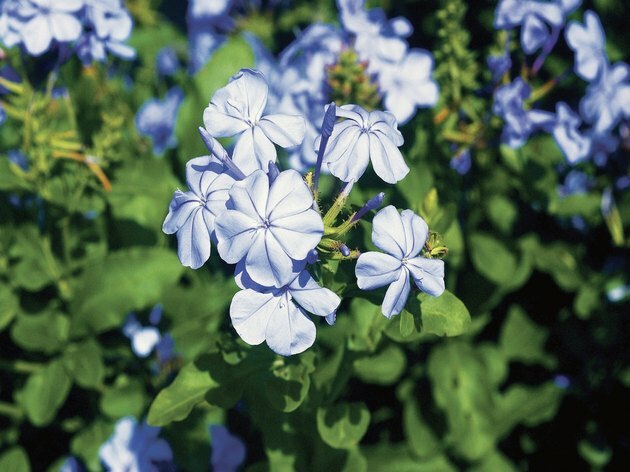 Plumbago shrubs produce clusters of five-petaled blooms. Prune Plumbagos regularly to maintain shape and form, and to prevent them from outgrowing their planting area. Plumbagos produce flowers on new wood and thus respond well to judicious pruning. Although they tolerate heavy pruning, cutting too frequently can adversely affect growth. Infrequent pruning, however, encourages rambling, leggy growth, which can be unattractive in certain landscape applications. Although all Plumbago cultivars require pruning, most are not suitable for hedge use, which requires frequent shallow pruning of the top foliage layers. Avoid indiscriminate "haircut" pruning of plumbago shrubs, which only removes the top layer of growth, as this can reduce flowering and adversely affect the growth of the plant. Use thinning cuts that remove approximately one third of a given branch, and avoid removal of more than 10 percent of plant tissue at a time. Remove all tissue that is dead, diseased or injured. Cut back long branches to a bud or lateral joint, and ensure that each branch is cut to a different length. Plumbago plants produce buds on tissue grown during the current season, which means pruning while the plant is actively flowering significantly reduces blooming. Light pruning to correct undesirable growth habits, such as forks or multiple stems, can be performed in any season without harming the plant. Heavy pruning, in contrast, is best performed in the dormant season. Most Plumbago cultivars bloom from May until the first significant frost, and pruning during this season should be limited to the removal of spent blooms. Although Plumbagos seldom exceed heights of 5 feet, ladders may sometimes be required for safe pruning of out-of-reach branches. Use hand-held pruners to remove spent blooms and branches less than ¼ inch in diameter and saws for anything larger. Both saws and pruning shears are available in extended versions, for hard-to-reach areas. Avoid the use of large lopping shears on Plumbago shrubs, as they have the potential to damage the surrounding plant tissue. A native of Southern California, Patrick Robartaigh earned a Bachelor of Arts in history from California State University, San Bernardino in 2008. He specializes in topics related to history, the outdoors and culinary arts.